Sylvester Allan Solomon Dias (1937 – 2013) was always known as Sylvester, or simply Dias, and there wasn’t a more lion-hearted cricketer in his time be it with ball or bat. He gave his all to the game. His recent demise would be mourned by all who knew him, and especially with whom he played cricket with or against. A medium fast right-arm bowler he had a long-run up and slung them down with all the energy and spirit at his command. As a batsman it took some digging to prise him out. Eventually he did represent Ceylon and played in the Leagues in England but statistics cannot do justice nor measure his large heart nor his effervescent wit. I first locked horns with him, at school level, when he represented Zahira College in 1957, but lost track thereafter for some time since our paths went different ways. Next we met up again when he joined, my club, Bloomfield C. & A. C. and then the fun began. He teamed up with Norton Fredrick and formed a fiery opening bowling attack at the Sara Trophy level. The dressing room was full of laughter whether we won a game or not. Unfortunately, at the start, in line with their respective characters, both had more ‘fire’ than accuracy and guile. Bouncers and short-pitched deliveries flying past the batsman’s ears were the order of the day spiced with a few choice words, especially by Sylvester, which at most times ended with the batsman himself having a good laugh! – though Heaven forbid if a fielder dropped a catch off his bowling. Stories that have adorned and burnished with time about past players in any country are par for the course. In Ceylon, tales about the deeds/misdeeds of M.Sathasivam, F.C. de Saram, Sargo Jayawickrema, and Lucian de Zoysa immediately spring to mind. There is no doubt in the minds of most of the cricketers of the 1960’s the name of Sylvester Dias joins that elite group. As a raconteur par excellence he was on par with Lucian de Zoysa. If only this duo got on stage they would been the Ceylonese version of Morecambe and Wise! My personal observations and those of others who went on an overseas tour of cricketing veterans to participate in a friendly international tournament in Denmark would readily confirm this view. It was in 1989, and the tour stretched for a couple of weeks with a brief stopover in England as well. However, it is to Sylvester’s eternal credit, the most important aspect of his contribution to this tour – ask all who went on that tour and they would readily confirm – was his joie de vivre and bonhomie that exuded at all times. On one occasion, en-route, we had to spend the whole night in the cold of the Moscow airport. Sylvester went on relating anecdote after another keeping us all in fits of laughter until morning when he had to board the flight. Thanks to Sylvester none of us felt the biting cold. Incidentally, Sri Lanka won the tournament but not that easily. The final was touch and go. We were chasing a total and the target appeared far away with only a few wickets left. When Sylvester’s turn came to bat, he tells me: “Mahinda we are going to win this match. Here, (handing his camera to me) take my photo when I am returning to the pavilion after we win.” True to his word he went in, smashed a couple of sixes and brought home the bacon amidst thunderous cheering from the meagre expatriate Sri Lankan supporters and from his team-mates. The Sri Lankan crowd then ran in to the middle and joyously carried him held high (a bit too high as it finally proved!) on their shoulders. As they neared the pavilion, Sylvester was shouting for me, and I dutifully ran in to the field with the camera and started clicking away furiously. However, after we returned to Sri Lanka, Sylvester had developed the film. Then he was horrified to discover that the photograph had registered a joyous crowd carrying somebody whose face from neck upwards the photograph had not registered! There are stories and stories about Sylvester that could fill a book – all ending in a laugh. It was a memorable tour indeed thanks to Sylvester whose winning smile always adorned his face. Winning the tournament was probably the icing on the cake but the cake was baked in the heart of Sylvester. That was Sylvester, despite whatever problems he had, his smiling face will always remain firmly etched in the minds of all who knew him. We bestow our sincere condolences to his family in this hour of grief. May he rest in peace. Sylvester Dias belonged to an era where Ceylon had an abundance of fast bowlers and to get into the team was a challenge. Dias was born and bred on matting surfaces where he was a terror with his lightning speed. People who saw him bowl have commented that they only saw the wicket-keeper collect the ball for such was the pace at which he delivered the ball. Dias had to compete for a place in the Ceylon side with outstanding bowlers like Darrell Lieversz, Norton Fredrick and Ian Pieris all of whom he had partnered with the new ball at some stage of his international career. �I didn�t care who came to bat in front of me whether it was Don Bradman or Viv Richards it didn�t matter. I had so much of confidence to get anybody out. I bowled the outswinger more than the inswinger and a cutter because my arm was a little squarish. I used to get the outswinger to go towards the slips and on the mat it was very vicious. The wicket-keeper who was about 6ft 2ins tall couldn�t collect my bouncer which travelled over his head to the boundary. We used Royal Corinthian balls and it had a fine seam,� said Dias. Although branded a matting wicket bowler Dias made a fine impression on his first-class debut for Sri Lanka Board President�s XI against Imtiaz Ahmed�s Pakistan team in 1964 when in the 3-day game he bowled his team to victory by eight wickets at the P Sara Oval. Dias, Fredrick and Pieris formed a formidable fast bowling combination to rout the strong Pakistani batting line-up for totals of 157 and 112. Dias took 2/46 and a career best 3/30 which included the wicket of Test batsman Ghulam Abbas whom he dismissed in both innings. But the wicket that gave him most pleasure was that of the captain Imtiaz Ahmed who�s off stump he uprooted with his third ball in the first innings. �They said that I was a matting wicket bowler. We had more matting wickets than turf in Sri Lanka during our time. At Moratuwa every match I played I would end up taking more than five wickets. I have got nine in a match but not ten. They gave me a first trial at the Oval to see how I would bowl on turf and you won�t believe I took 5/4 in 6 overs. That�s how I got selected to play against Pakistan,� Dias told The Nation. Following his success against Pakistan, Dias was selected to tour India with the Ceylon side led by Michael Tissera in 1964-65. Although he could not make it to the �test� side he performed well in the side games. Returning home he bowled successfully against the touring Hyderabad Blues team which comprised Indian Test stars like Abbas Ali Baig and ML Jaisimha taking 5/22 for Ceylon Transport Board (where he was employed) and 5/53 for Dr Wignarajah�s XI. In 1967 a strong CTB side comprising Ceylon cricketers in the calibre of DP de Silva (captain), Muttiah Devaraj, Lionel Fernando, Barclay (BG) Reid and Dias, qualified to play in the semi-finals of the Moin-ud-Dowlah Gold Cup tournament in Hyderabad. Although beaten by seven wickets, Dias left his mark on the Dungarpur XI capturing 3/46 and 2/29. �They said that I was the fastest seen since Charlie Griffith and Wesley Hall in India,� said Dias. �There was a single wicket tournament which followed and I came into the final but they played me out. When Buddhi Kunderan (India�s opening bat/wicket-keeper) gave a catch in the first over they called it a no-ball and he went onto score about 52. I was given out at 47. Even Pakistan did this kind of thing to us but we took it in good spirit. When DD Jayasinghe (former Ceylon cricketer) played cricket he would give Rs 10 to the umpire to get a good batsman out. Even then there was cheating of some kind. �We earned a lot of respect. Our discipline was different. We came onto the field in whites and clean boots. DD Jayasinghe taught us a lot about discipline. We never tried to argue with the umpires never disobeyed the captains or the seniors. We all contributed towards the same goal. The most important thing in life is discipline. We never came into politics from cricket it never entered our mind. Today first is cricket and second politics,� Dias said. When Bill Lawry�s Australian team visited Ceylon in 1969, Dias, playing in the traditional one-day game at the Colombo Oval, dismissed opener Jock Irvine for 19 and to celebrate that wicket he has given the name Irvine to his eldest son. Dias� chances of continuing to represent his country ended when he decided to live in England and play in the Lancashire League in 1972. �We never got money for playing cricket in Sri Lanka. The most was six bottles of beer after a match. We played for the love of the game but there were no prospects. It was Dr HIK Fernando who helped me to go to England. He gave me the address of Bob Bartells who provided me accommodation and a job and contracted me with Rochdale as a professional in the Lancashire League. He helped me a lot,� recalled Dias. �No one sponsored me to go to England I had to go on my own. I paid only Rs 7500 for the Aeroflot flight to England. I had the honour of playing with the great Sir Garfield Sobers in the same league. He was playing for Littleborough and I for Rochdale as professionals. Sir Garfield got about 100 pounds and I received 33 pounds and they gave me a job also,� he said. Dias married Pushpa Ranjani Obeysekera rather late at the age of 47 and his youngest son who is 14 years old was born when he was 59. They have four sons but none of them have followed in their father�s footsteps and played cricket. From the money he earned playing in England Dias brought 84 perches of land on the main Minuwangoda Road where he resides and also some estates. 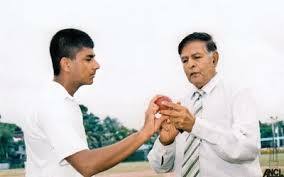 Dias had a distinguished school cricket career. At the age of 11 he was playing in the under 14 team of St Anthony�s College Wattala. Then he went to De Mazenod, Kandana and played in the first eleven side at the age of 15. His career was curtailed when he broke his leg in an accident and he couldn�t play for nearly two years. He resumed his cricket at Zahira College Matale before coming to Zahira College Colombo where he displayed his prowess as an all-rounder. �I normally bat at no. 7 and I always I get 50s and 60s but not a hundred. But against Dharmaraja at Kandy, Mr Bahar our coach told me to bat two down and to get into my pads. I had never gone to bat at no. 4 before. When the score was about 270-2 I walked out to bat. I clobbered the bowling and we got 536-2. I was not out 104 and my partner Chuncheer was 224. That�s a record for Zahira against Dharmaraja. I also took 13 wickets in the match,� said Dias. Dias played Sara trophy cricket for Bloomfield but over a rift where �they had their favourites� he left them and didn�t play for about a year or two. �Nisal Senaratne (former Cricket Board secretary) and Stanley Fonseka approached me and told me, �Sylvester what a lot of talent you have, why are you wasting your time. Why don�t you come and play for Moratuwa SC. I was then playing for the CTB and I was getting a lot of wickets. The first match I played for Moratuwa SC I got 5/20 and till I left them to go to England, there wasn�t a single match where I failed to get five or six wickets. �When I returned in the 1980s I was told to captain Moratuwa SC against Police SC because it was the first match they were playing on turf. I got seven wickets for 35 runs. In another match against Adastrians I got two hat-tricks in one innings. I took nine wickets in that match. We performed a lot but we didn�t talk much about it. We had a bigger crowd following cricket during our time bigger than the attendance at today�s Test matches. The Moratuwa crowds were cricket fanatics they lit crackers when I came to bat and garlanded me when I took wickets. I had a following and they used to tell me they never saw the ball when I bowled. I played for the Employers Trust Fund Board till I was 59 in �C� division cricket. From my schooldays I enjoyed bowling fast. The speed was generated by the energy in my body I had so much strength,� said Dias. �I got around 900-1000 wickets in Sara trophy cricket alone. We used to play about 10-12 matches a season and I used to get an average of about 50-80 wickets a season. I played for about 10 to 15 seasons but there are no records to prove it. We started with a lot of difficulties. We never even got a packet of rice to eat even for lunch and we were never remunerated. �I used to work in the night and come for the match the next morning. We had to play cricket and work to survive. We had to work overtime but fortunately for me there were a few good officers who permitted me to work during the day time and get off. I started with the CTB and Shelley Wickramasinghe is the one who gave me the job. We were paid Rs 135 as salary for the entire month but we managed to save from that amount also. Today you get so much but nothing is left and you are in debt to other institutions getting loans out of banks etc.,� he said. Dias was critical of those who are administering cricket in the country today. �What is happening at the Cricket Board today is very pathetic. All the rogues have got in and they are robbing it left, right and centre. Even people who are earning big salaries are also robbing. During our time we never got any money we only enjoyed playing cricket. I am not regretting it one bit. We never had coaches like today the team is 11 players but sometimes the support staff outnumber them. They are wasting money which can be used to help past cricketers. �It�s an embarrassment for the player when different coaches tell different things, this is utter madness. They know there is a lot of money in the Cricket Board and they create these positions to play out and rob. This is a big racket. Take the case of Lasith Malinga. Who can coach him like that? It�s his inborn talent. If he is coached he won�t be effective. So many coaches are not necessary for a team. They are doing it for their benefit. When Brian O�Brian and Bobby Schoorman came to coach they could do nothing about us. There are players who can be corrected but not all. Some have inborn talent in them and if you go to correct them they will lose the little they have,� he said. Dias said that he was happy that he belonged to an era when cricket was played for the pure enjoyment of it. �There was no security, nobody to sponsor us and no prospects but we still went on. It has done wonders to us because it has made us healthy. I am 73 and I can walk about. We enjoyed our cricket and that was part of our life although we didn�t benefit by it. The country benefited because there is so much of money in the Cricket Board today,� said Dias who is nursing a foot injury which has been operated 13 times. �I was helping the fellows who came to polish my chairs and a glass pricked my leg. It went up the leg and I ended up in hospital. This happened about five years ago and it has not healed since I am a diabetic. You can�t cure it but only control it. I don�t go for public functions because I can�t eat and drink. I have to curtail my activities due to this injury,� Dias stated. Former Ceylon cricketer Sylvester Dias who was featured in our series Living Legends writes with reference to an interview with him which appeared in these columns on September 19, 2010 that he has been misquoted stating that �Mr DD Jayasinghe (former Ceylon cricketer) would give Rs. 10 to the umpire to get a good batsman out�. Mr Dias writes to emphasize that what he meant was that �anyone would give Rs. 10 to get Mr DD Jayasinghe out�. He further states that �the late Mr DD Jayasinghe was a gentleman to his fingers tips as would be endorsed by all who knew him�. I agree wholeheartedly with the statement that D D Jayasinghe was agentleman too his fingertips. So was his brother M D Jayasinghe, my cricket coach at St. Aloysius in the 1950s. DD Jayasinghe was good enough to be in Ceylon’s top thirty players and even in the top eighteen. See one of the pictures in my ESSAYING CRICKET.